Chocolate makers from Japan to Sweden, Ecuador to Brooklyn came together to celebrate (and sell) the sweet stuff for four days from November 11-14 at the 13th annual Chocolate Show. Packed with people, the exhibit hall was a chocoholic’s dreams come true. You could sample for hours and then buy what you like for more indulgence at home. Wander the aisles named “Bittersweet Chocolate Boulevard” and “Cocoa Bean Street” and taste from table to table. Or you could stop in the café area for free espresso care of Café Bustelo, a sponsor of the show. The holidays are around the corner which means culinary indulgence is too. Gorging on food is half the fun of the season. With a wait in line for up to a half hour and ticket prices at $30 per person New Yorkers looked ready to celebrate, even if it means gaining a few pounds. 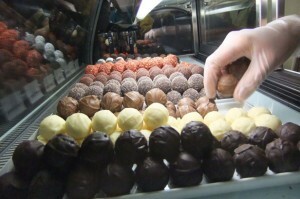 This entry was posted in Photo Slideshows and tagged chocolate, culinary events, food photos, holidays, NYC food. Bookmark the permalink.